Six a.m., and I’d just finished a long night on patrol. An infuriating highlight had been dealing with a frustrating situation where a drunken woman had caught her drunken boyfriend sexually fondling her underage child. A huge fight had commenced during which he bit her cheek open, yet after we arrived and worked out all these details, she was back kissing him, bloody that both of them were, refusing medical treatment and forgiving him for his surely one-time indiscretion. All the while the distraught child sat wide-eyed observing this co-dependent insanity. I’d showered and changed into civilian clothing, awakened my son and got him breakfasted and ready for pre-school. Chattering and chirpy with his usual early morning cheerfulness, I was emotionally and physically tired, yet never tired of seeing his little face and bright smile. It was a twenty-five minute drive, and he talked the whole time. I walked him in, and left him with the teacher among the class of other four year olds, then headed back home in the brilliant Alabama sunshine. When I got there I continued my usual routine of logging into a favorite website where I’d met a number of internationals. I started the voice chat program with a special friend. I was tired, but I’d sleep more deeply later in the day, a few hours before my shift started at ten pm, and when my mother would care for my son. Seconds later my pager and phones all began going off. And I felt a grimness I have few times in my life. Glad I’d a fresh uniform, I dressed again eyes burning with lack of sleep but purpose, directing my mother to go get my son. She hadn’t heard either, but she responded immediately without question. The police department was mobilizing to secure points in the city, and especially to help the military base, Redstone Arsenal, which is one of particular significance regarding sensitive programs and weaponry. The city was silent. If there was sound, it was muted. Voices were muted. Eyes were filled with confusion, fear, disquiet. Cars had stopped on the street as drivers had been overcome with emotion. I utilized a higher speed than normal headed to briefing. All general flights and airports were grounded. The arsenal was locked down. Anyone non-critical was told to stay home, while I watched crowds near one of the gates as lines were backed-up curving around onto the highway on 565, and down the common streets inside the city. Everyone had to be checked, each person, each vehicle before they could be cleared for admittance. A couple of men from my unit were in the National Guard and had received their orders and would be taking their flights later in the afternoon. The story unfolded and evolved world-wide. As I stood weeks later, supposed to be directing traffic but I didn’t need to for everyone was behaving admirably, a plane passed overhead and I shivered with dread imagining it plunging to the earth. The tragedy was terrible, and like billions, it affected me on an intimate level as I realized things I’d never thought of before, thinking thoughts I’d never thought before. I remember a National Geographic magazine I read, I still have copies of it somewhere, with a dedication on the last page. A photograph of a young man, maybe twelve years old and his parents, smiling and happy, for he’d won a grand contest to fly to awards ceremony where he would receive a certificate of achievement. They were on one of the flights and were killed. What horror, what terror they experienced knowing they were going to a fiery fate! I thought of how those flights must have been. But tragedies happen around the world everyday. Senseless deaths, premeditated deaths, rapes, child abuse, humiliation. On an individual scale, one person dying or being hurt, or on a grand scale though everyone dies alone. This event finally brought it home to a new generation of Americans just how vulnerable they too can be. It made people angry. I’ll never forget the broadcast following the event where actors and others spoke their thoughts. I remember Clint Eastwood standing in that way he does, strong and meaning business. I remember the glint in his eye as one narrowed in the way we know he does in films, but it’s really his own personal expression as well. I remember his emphatic statements, and I believed if he could have, would have blown away whatever fuckers caused the deed right then and there with no remorse. And I wouldn’t have blamed him. To me, just to be honest, too many Americans especially have a curious view about death and killing. It’s my opinion some people need to be killed, and that’s that. When they get killed, I don’t lament and I don’t have any ethical debate about it either. And it’s not about hate. If they are guilty, be done with them. Death is a part of life. Nothing to truly fear, no need for remorse and some deserve it. Yes, I understand that might seem unnatural to some, but all I can say to that is…you have to understand Native Americans somewhat to get what I mean by that. It’s not psychopath, it is empath. Necessary protection for those alive to keep living and cut away that which destroys. In other words, one can be killed and not be destroyed, one can destroy and not kill. Some need to be killed to stop the destruction of others. On September 11th, at the twin towers, many were simply living their lives, going about their business, just as I’d done the same morning with my son, yet they’d had it taken away from them. Horrifically taken away from them. But it happens around the world, and some Americans check the news but that’s there and not where they are, and it’s those people (those people are always fighting, etc. etc.) so it doesn’t affect them in the same way. It doesn’t have the same impact. Following 9/11 I didn’t watch television anymore than I ever had, and still don’t now. I don’t even have a TV. I didn’t follow news stories or read as many articles or stories as possible, the coverage of the families, the lost ones, the brave, the heroes. I was very, very cognizant of what was going on. Those fellow officers came back and told what they saw first hand. I didn’t need to see it in media, just as they didn’t. Locally, I knew parents who’d lost both daughters in the building. They’d gotten jobs there and thought it was so lucky they could live together still and remain close. With my review site I’d received several requests in the past couple of months from those seeking feedback on special collections, fiction and non-fiction related to 9/11. When I declined, because I found it was of a political nature that didn’t clear my guidelines, I received a surprising number of nasty responses insulting me personally (who they don’t know) as well as the country I was born and now live in, Germany. I even got accused of being a Nazi sympathizer. Go figure. My lamentation for those lost goes beyond nationalistic or even personal, but down to the root of humanity that empathizes and actually feels the others. That day, it was if a part of my flesh were cut away, and those people were MY people, but I didn’t make it a cause for further hatred and intolerance of others as so many have done. And for all they died in such terror, I feel a peace for them now. They are all there. They are at rest and don’t have to endure such as we anymore. They will only know joy, however and by whomever or whatever supplies it. That is my belief, so I can embrace them, and though it still can hurt, I am not consumed by agony. Though I hate how they died, I won’t let their deaths make me into something that exists with hate or darkness. P.S. 9/11 has become a rallying cry and touch point in modern America, where each may and are required to imagine those last terrible moments for so many, and use it to fuel their convictions. Usually against anything or anyone stereotyped to be Muslim, anything or anyone as a threat to the USA superiority or justice. Yes, heavy irony there. Wounded Knee, Sand Creek, Jamestown, Staten Island (bet you didn’t even think of that one), Rhode Island, a thousand more, known and unknown in whitewashed history of Native American genocide. As strong and poignant, by nature of our spirits and beings, and because of our connection to each other past and present, be it a hundred years ago or a thousand times thousands, Native Americans don’t forget, especially in that American selective memory, concern and hypocrisy are the “order of the day”. Posted in Current Events, Personal Entries. 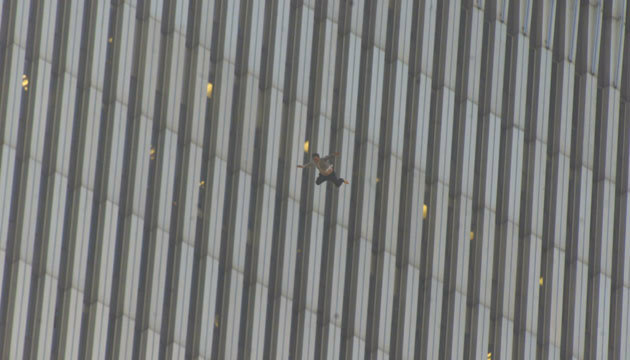 Tagged 9/11, americans, chief aupumut, falling man, grief, hatred, intolerance, native american quotes, nine eleven, september 11th, twin towers, USA, world trade center. Thanks for your essay. An event of this magnitude really can bring out different sides of people, and cosmic questions about what life and death means becomes sharper. I quite agree, and honest, true introspective thought should bring out the best of people. I believe for the most part, it can.